JAMESTOWN — A Greeneview freshman had a breakout game in the girls varsity soccer win, and the Ram boys varsity squad fended off a torrid Legacy Christian comeback to also claim a win, Sept. 2 at Don Nock Field. 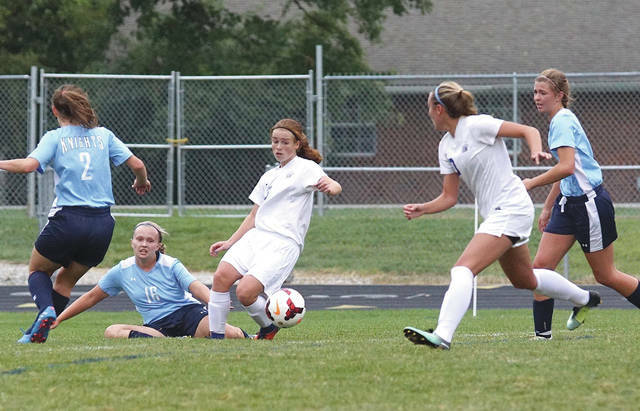 Josie Faris scored three goals and assisted on two others in the Greeneview girls’ 8-0 win over Legacy Christian in the opening game. Senior forward Olivia Maxwell scored two goals for the Rams, while Kayli Vipperman and Faith Rutherford each scored once in the win. Faith Rutherford, Kaitlyn Hinkle and Brooklyn Langford each assisted on goals, and LCA was credited with an own goal as wel. Faris had a simple explanation for her team’s success. The Rams girls team had a 5-0 margin at the half, and never seemed challenged by Legacy Christian. The same can’t be said for the Greeneview boys team. They had a 2-o lead at the break, on a pair of Dart Hovan goals, but LCA nearly scored right before the half. In fact, they did, but Keano Hammerstrom’s header goal off Roman Newsome’s free kick was disallowed. The game officials ruled that time had expired before the ball crossed the plain. 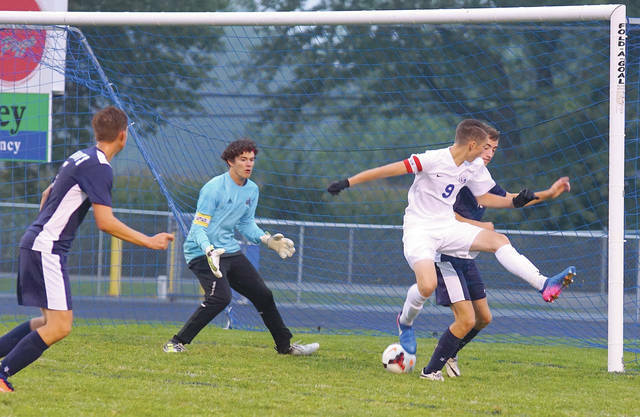 Greeneview’s Hovan scored his third goal of the evening with barely four minutes gone in the second half to put the Rams up 3-0, and it turned out they needed each one of his goals. With 1:16 left in the game, Hammerstrom knocked a kick into the upper right side of the Greeneview goal to put the Knights on the scoreboard. Then with 19.4 seconds left, Newsome launched a rainbow shot that dipped just under the Greeneview crossbar for a second score. Greeneview then ran out the clock to preserve the win. “I think Dru Arrasmith played a nice game for us. And we moved Kelle Hart to midfielder, and then he ended up playing defense for us, and he did very well. Quintin Conley is our defensive midfielder, and he’s a workhorse out there. We win the ball at the midfield because of those guys, and that showed tonight,” Rams coach Bob Eakins said. Arrasmith provided one assist and Hart had another. Both LCA teams will host Troy Christian in Metro Buckeye Conference action on Tuesday Sept. 5. Greeneview’s boys and girls teams both play at Tipp City Bethel that same day. Freshman Josie Faris (13) shown here faking out a pair of Xenia Legacy Christian defenders and passing off to a Greeneview teammate, scored three goals and assisted on two others in the host Rams’ 8-0 win over the Knights, Sept. 2 at Don Nock Field in Jamestown. Greeneview junior midfielder Dru Arrasmith takes a behind-the-back shot around a Legacy Christian defender, off senior Dart Hovan’s corner kick, but LCA goalie Clint Brads was there to make the stop, during first half play in Saturday’s Sept. 2 boys high school soccer game at Jamestown’s Don Nock Field.